You are currently browsing the The Pet Product Guru blog archives for the day Friday, May 11th, 2018. Since our beloved cat Molly left us, Millie now “rules the roost.” We are eventually going to get a canine family member but we need to be assured that the new family member will get along with Millie. Now Millie is a funny cat, she’s very skiddish and gets frightenied easily so our decision has to be a good one. There are several dog breeds that do very well with cats. The Beagle – They’ll chase a cat around outside but are very good with them indoors. However, keep in mind that a beagle is not the right breed for everyone. They are okay as watchdogs but make friends too easily to be guards. They are also not easy to train, so if you are looking for a dog to obediently follow household commands, you need to search elsewhere. .The Boxer – The Boxer will like to play with your cat but will never do her any damage. Keep in mind that if you have a cat that gets frightened easily, this may not be the best choice for you. Bichon Frise – This is a very happy, very social dog breed that will likely view a cat as just another small playmate. Just make sure that you have a playful cat. For very laid-back cats, you will need to supervise their interactions closely, since the bichon may be a little too happy at times when the cat wants to be left alone. The Golden Retreiver – An excellent choice if you have kids and other pets. The are very good with cats. hey are excellent with cats of all sizes and ages. The golden retriever is unlikely to be rough with your cat even when playing, and, like most dogs, will just consider the cat part of his family if they are introduced while he’s still a puppy. 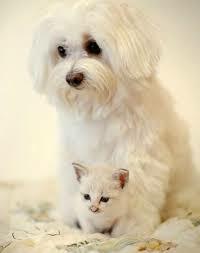 Maltese – A Maltese likes to lie around and will usually leave your cat alone. The may not even like cats but will ignore them rather than make their lives miserable. Even a tough Maltese will not take on a lazy cat. Thanks to pethelpful.com for providing some of this information this post. Do your research and make the right choice! Listen to our great oldies radio station – Edgewater Gold Radio. Radio —the old fashioned way. We play a great variety of oldies from the 50s 60s 70s 80s and pops standards. All oldies all the time. Download the free Edgewater Gold Radio app or listen from our website, edgewatergoldradio.com.